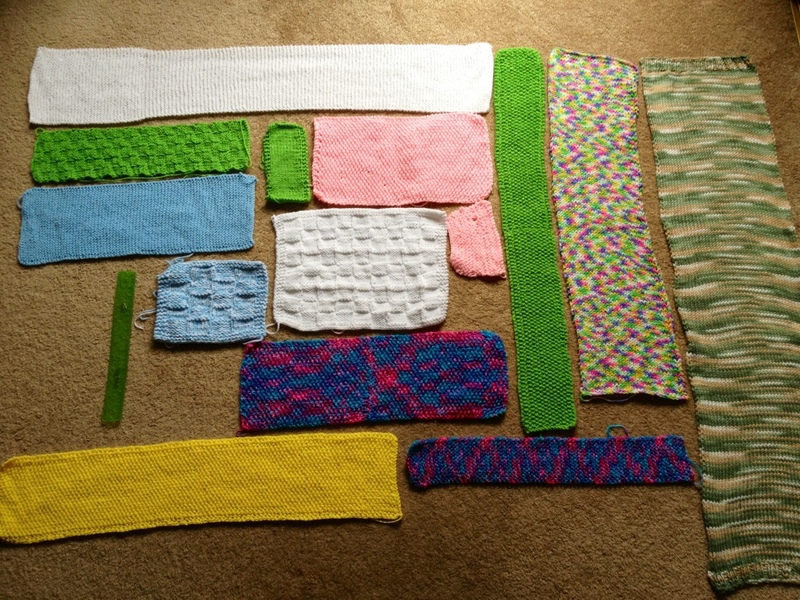 These swatches of awesome colors and patterns arrived today from Cathy in Pennsylvania. The skill it took to make these is on a whole other level from what I’m doing. 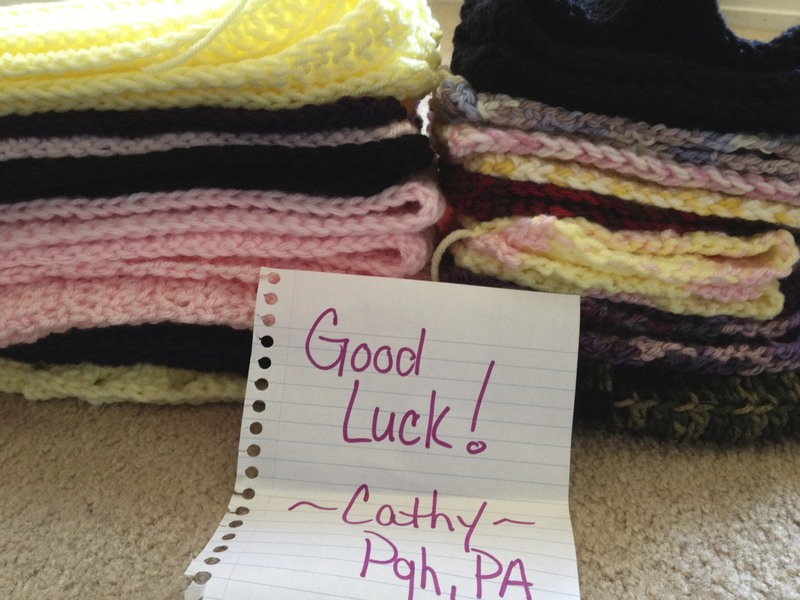 These swatches, from Marti and Sandy in Virginia, look so professional and the yarn is so soft, I may connect them together to keep as a blanket when the bomb is defused. 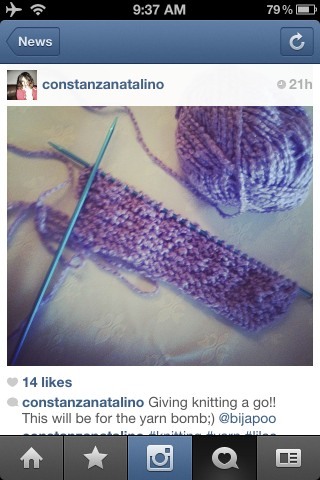 Constanza in Chile is working to get hers in under the wire. 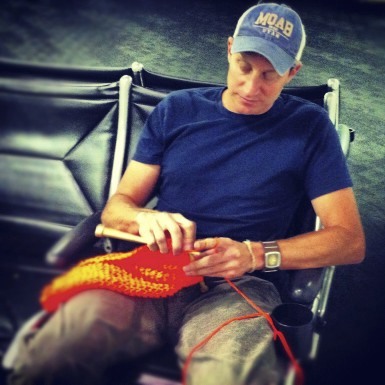 And lest you think I am sitting idly by while everyone else does the work for me, I’ve included a pic of me knitting while waiting for my flight at the LA Airport. It’s not too late to contribute swatches to the effort, but it’s getting close, so hurry! May 25 I start to map it out and connect the swatches to each other. 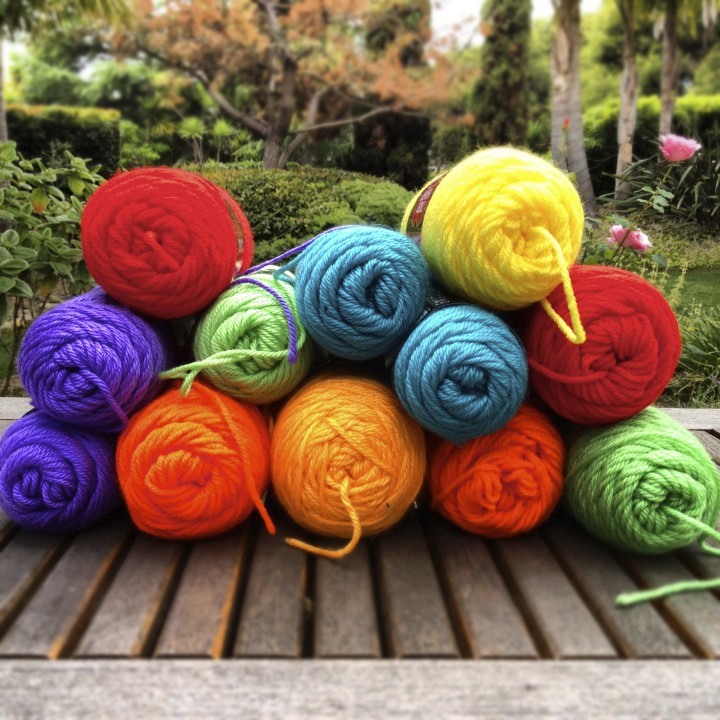 While recruiting knitters to be a part of the Santa Barbara Yarn Bomb, the same questions keep popping up. This entry is going to provide all of the logistical details for the upcoming YB, answering those questions, making it easier to recruit more team members and helping assure that we are all on the same page in terms of what is expected and what we are working towards. 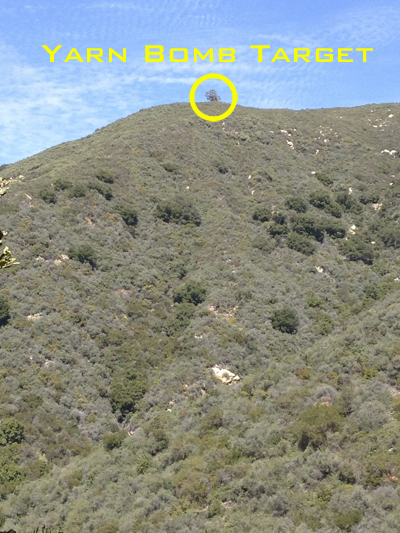 There is a Eucalyptus Tree 2.6 miles from the trailhead on the Cold Spring Trail (East Fork) in Santa Barbara, CA. 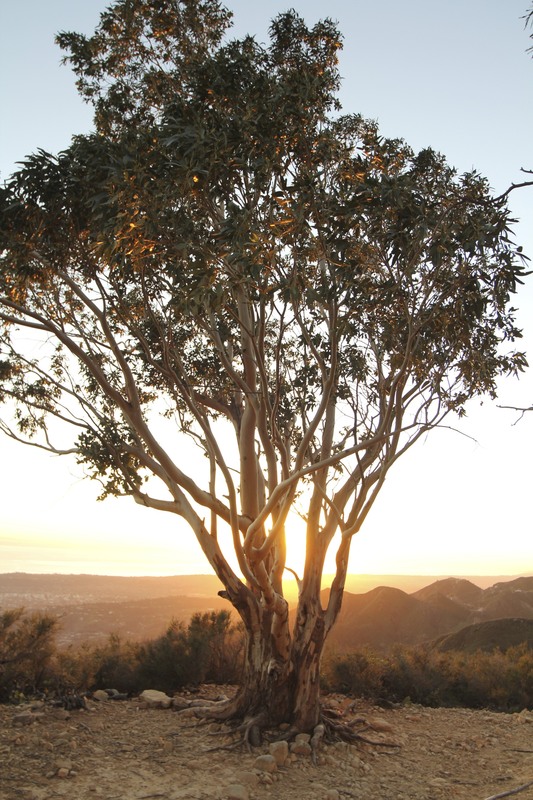 It stands approximately 2,500 feet above sea level and because it is at the edge and surrounded by low desert scrub brush, it can be seen from a distance. 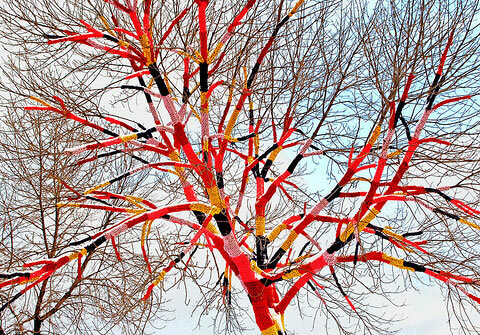 For those who are concerned, only yarn is used so no damage will be done to the tree. 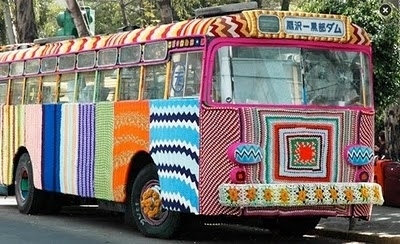 The plan is for our yarn bomb to be up and ready for viewing on Sunday, June 10th, International Yarn Bombing Day. In order to accomplish this, we will need to start bringing together all the contributed pieces about a month before that. 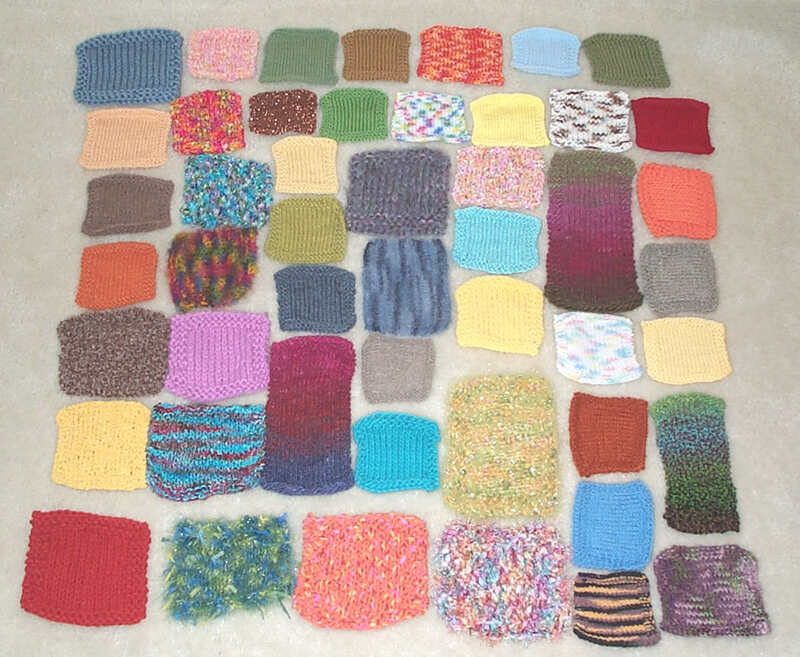 At the moment we have 17 contributing knitters from California, Georgia, Florida, England, France and Bulgaria, but we need many more. 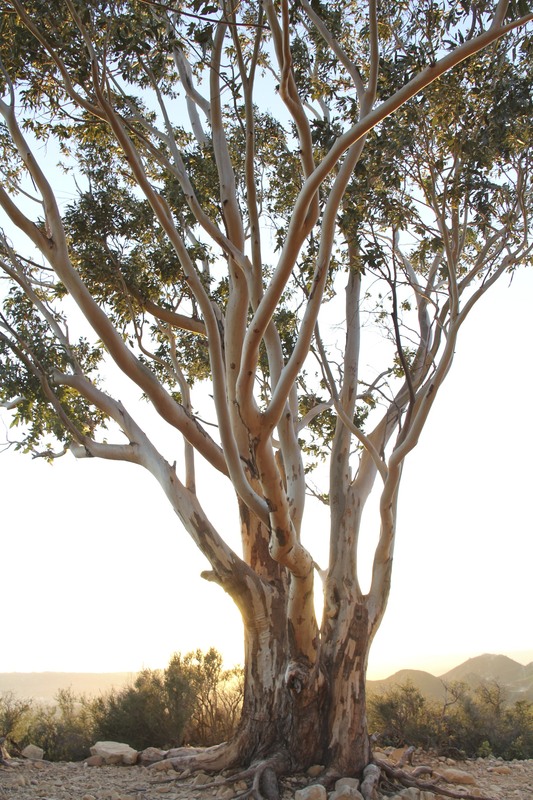 This tree is more than 30 feet high with many large branches and a trunk that is more than 9 feet around. In keeping with the hippy California style and representative of the collaborative effort, this yarn bomb will have a patchwork look. 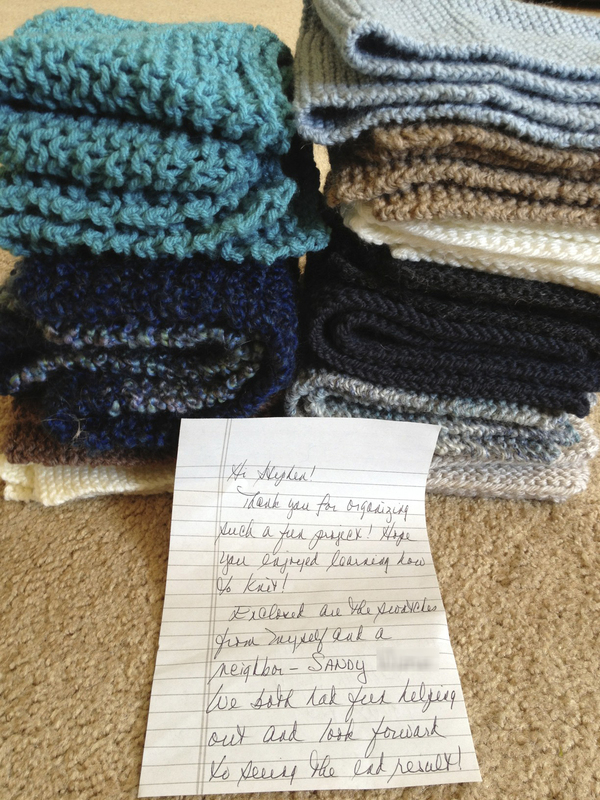 We need knitted swatches of any size, color and pattern. They don’t have to be fancy or even perfect. If you want to join the team, let us know by replying to this post. 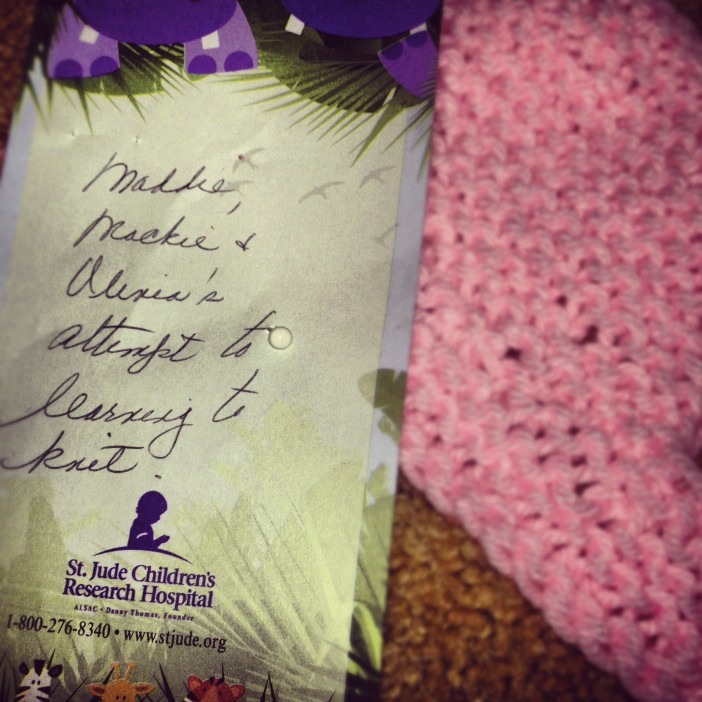 You can also help simply by bringing our project to the attention of knitters who you know. I will be happy to give full credit for your contributions and provide plenty of pics of the final result. 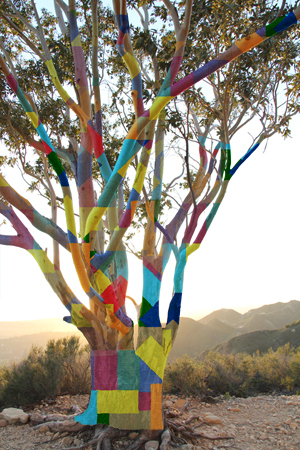 If you live in Santa Barbara or will be here in June, we could use your help bringing the swatches together, covering the tree or just to hang out while we do the work. We need your help. Please share this post with as many people as possible. THANKS! It’s been 9 days since I took up knitting and I’m happy to say, I’ve made some progress. Couple of things I’ve learned along the way: Knitting tight stitches makes for a much nicer result, but it’s very hard to knit tightly with wooden needles. It was frustrating the hell out of me and I was developing a callous (keep your snide comments to yourself), so I recently switched to metal ones. Knitting needles are allowed on the airplane and it’s a great way to pass the time when flying. 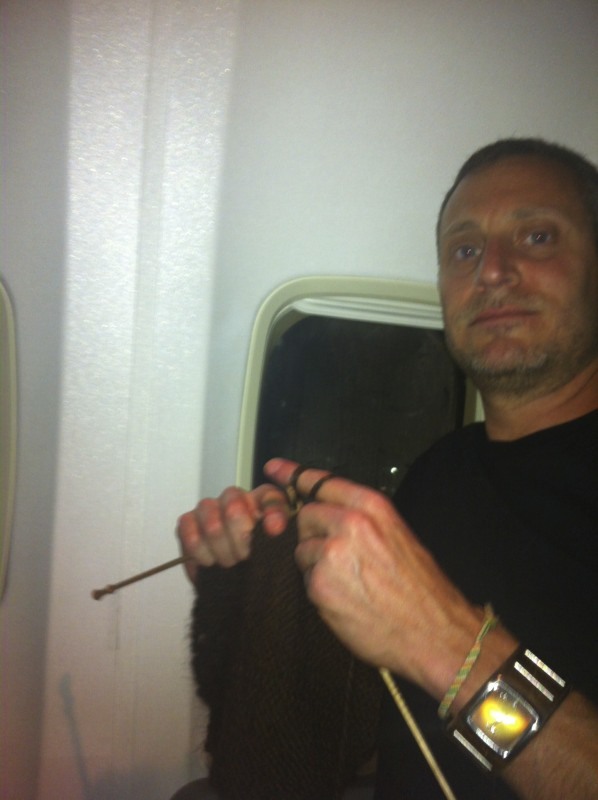 Unlike reading on an iPad or Kindle, you can start knitting when you board and go right on through to deplaning. Once you get your rhythm, it’s a meditative activity, allowing you to be productive while clearing your mind. 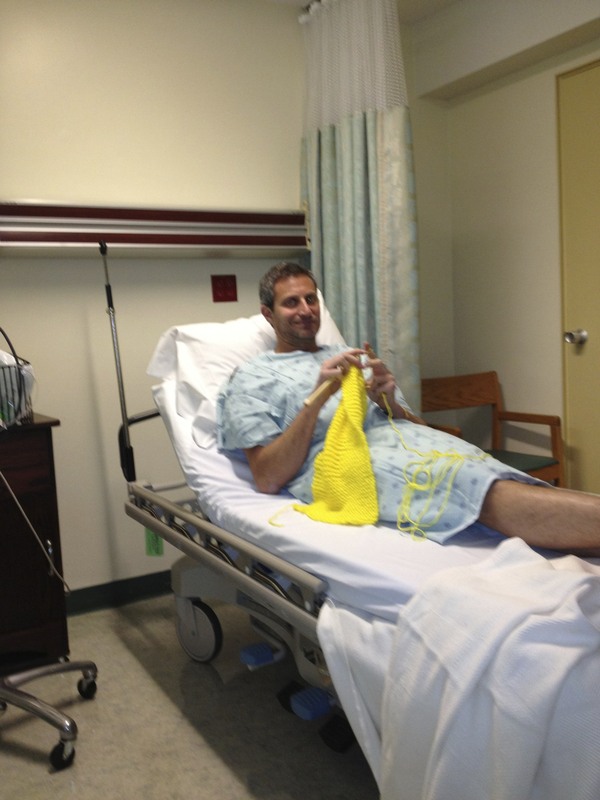 As for my knitting skills, I’ve made a few mistakes, which I’ve highlighted in this photo. Some have suggested that I start over again (thanks for the support! ), but I’ve decided instead to make this first piece a record of my progress. 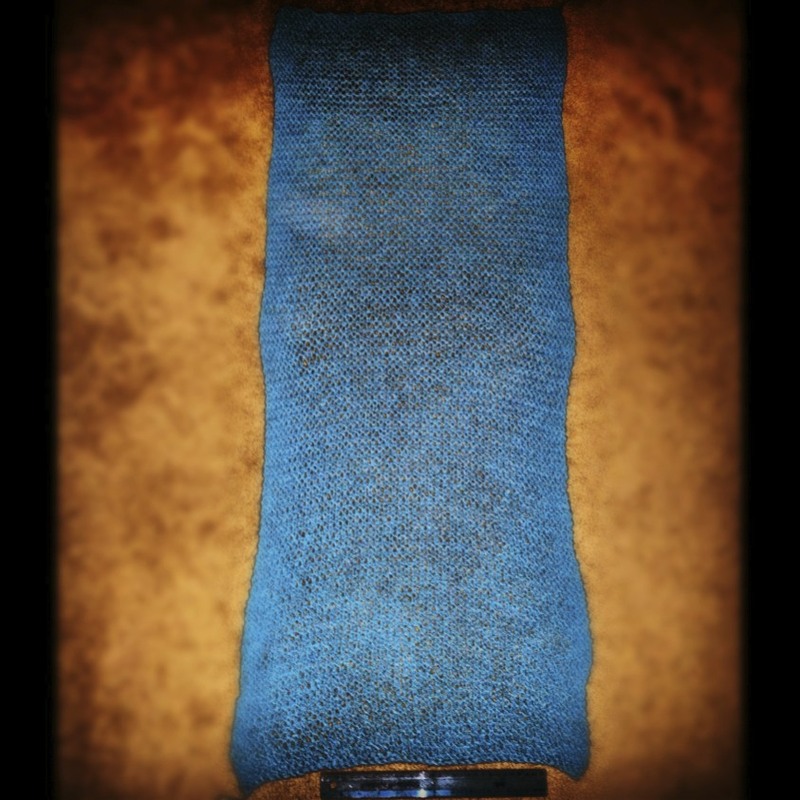 A sort of progressional totem pole of my knitting evolution. Hopefully, I’ll get better and the progress will be apparent for all to see. Now for the fun part. 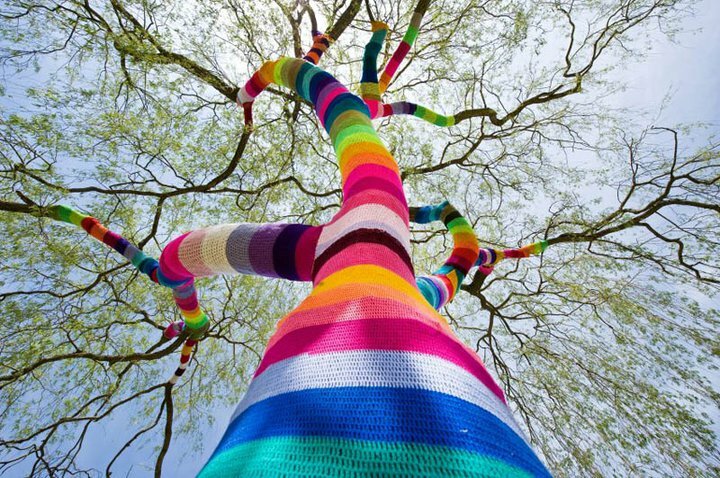 I know I said that I wasn’t going to jump right into Yarn Bombing, but I’ve changed my mind. Making a scarf is fun, but to be honest, I don’t wear scarves and no one else would want to wear this debacle when I’m done. 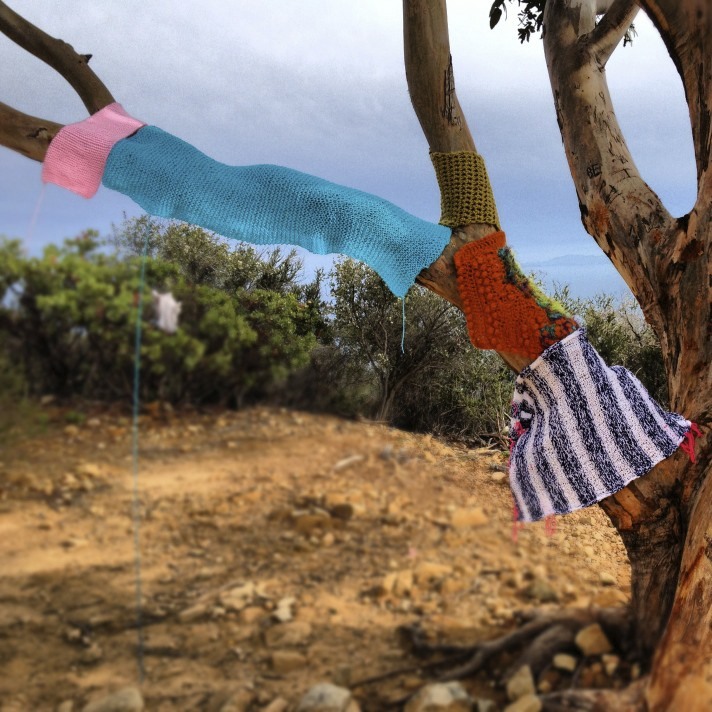 Instead, I am going to attempt a yarn bombing of this tree on the Cold Spring Trail in Santa Barbara. 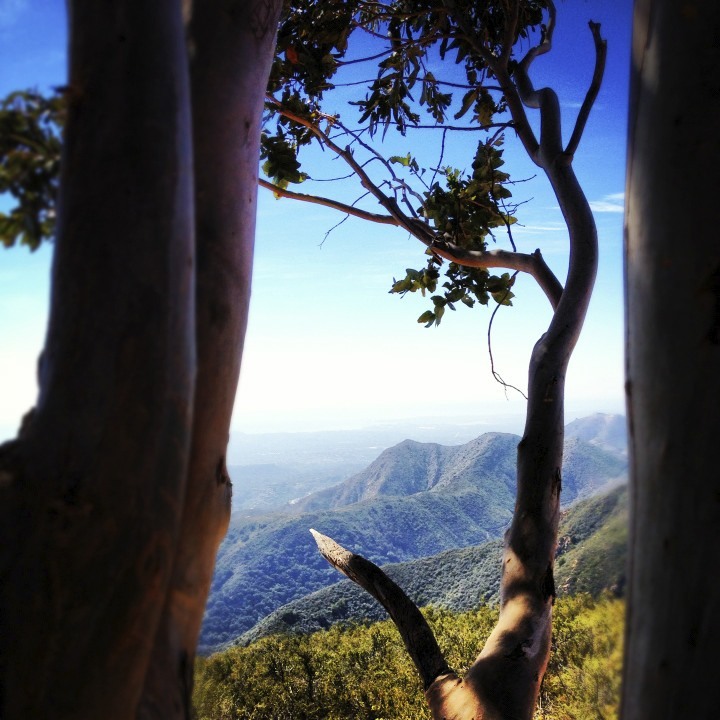 It’s marks roughly the halfway point to Montecito Peak and is a favorite destination for many hikers in the area. It’s nearly 30 feet high and right on the edge of the mountain, making it really stand out among the tiny desert shrubs surrounding it. You can see it from a great distance along the trail. 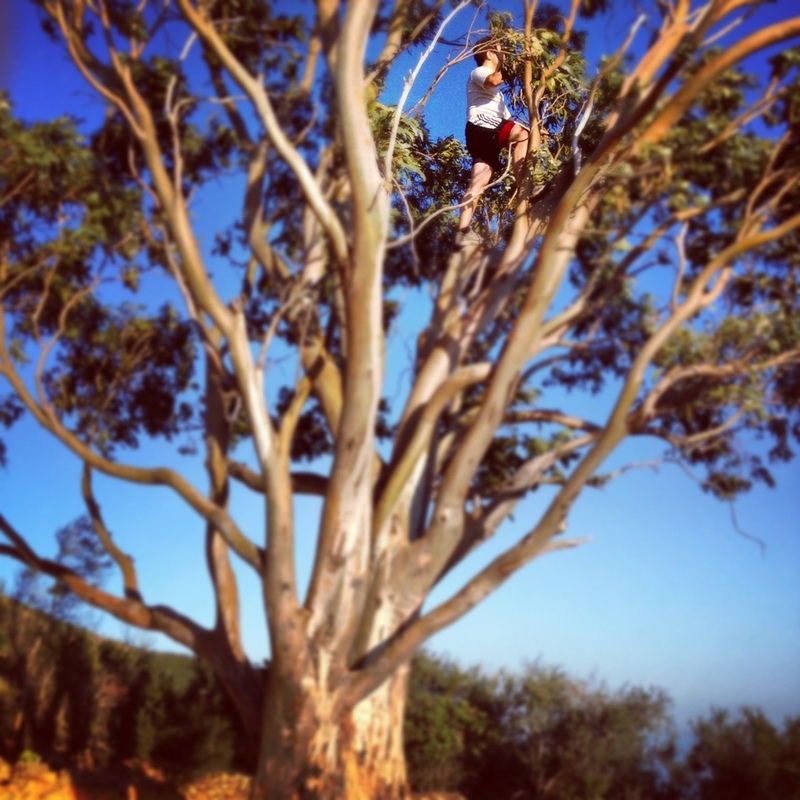 However, I won’t have a shot at covering the whole tree without some help. 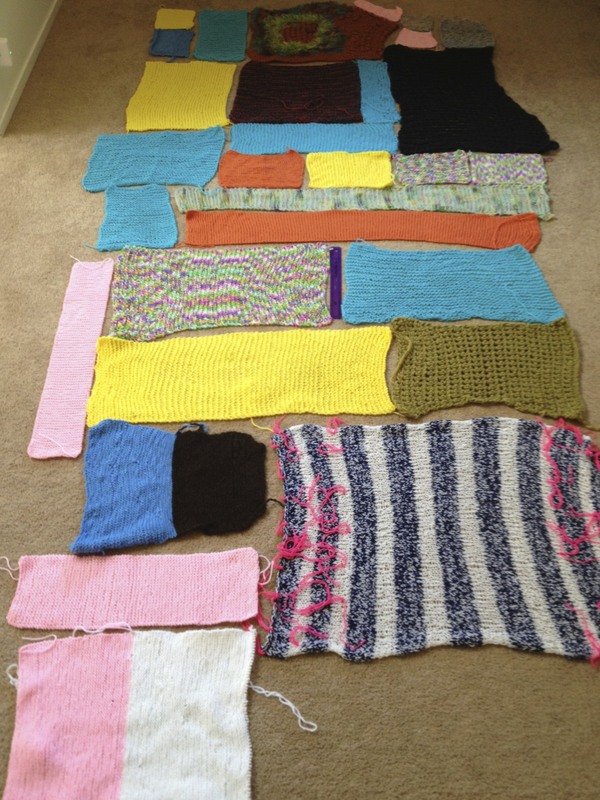 So, if you or anyone you know is a knitter, I’d like to enlist your help by asking you to knit a section(s) that I can connect to mine. 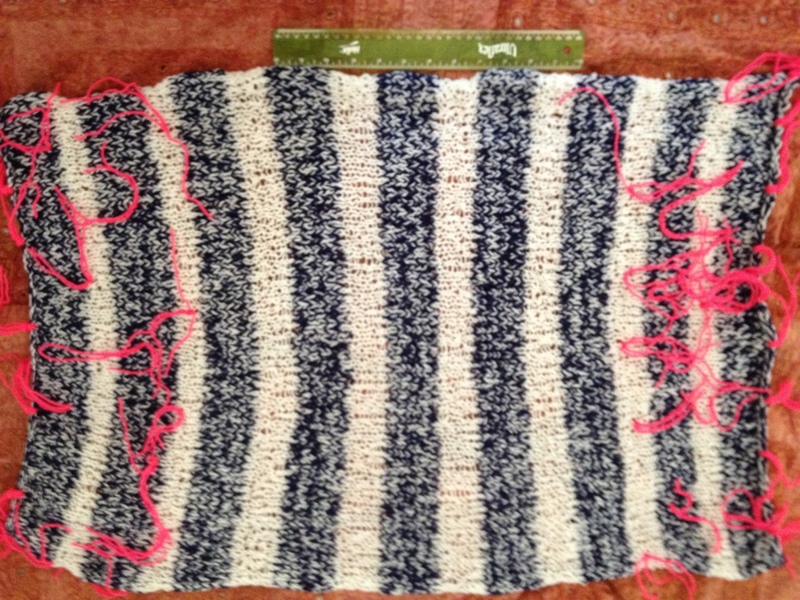 I don’t care what color, what pattern or even how big you make it, so long as it is yarn and knitted. I simply need to cover surface area. 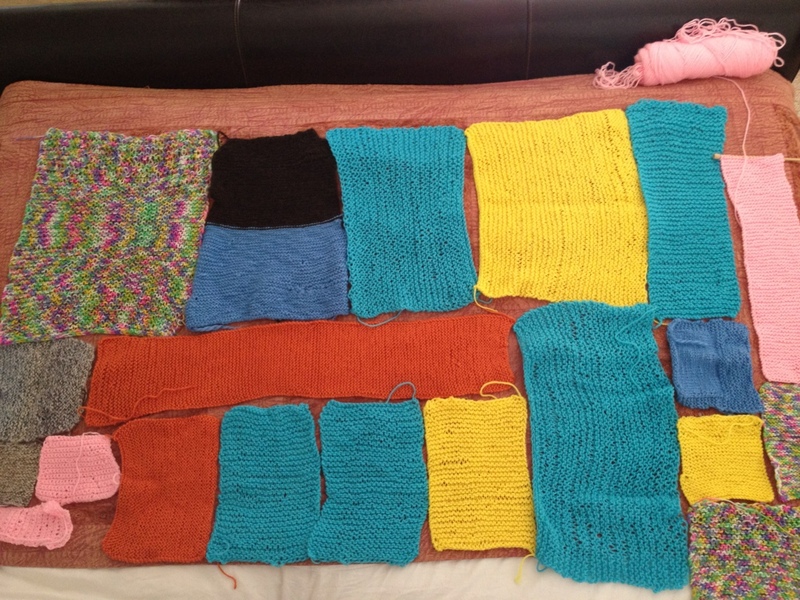 If you help by knitting some swatches and mailing them to me, I’ll give you full credit for your efforts and send you pictures of the finished product for you to share with your friends. Come on, it should be a blast to be part of a yarn bomb, so please help me by knitting a swatch AND passing this plea along to others. 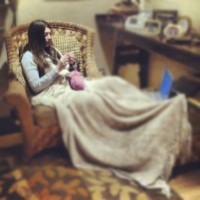 If you don’t know how to knit, now’s a great time to learn. Go to a local knitting shop and I guarantee they will be very happy to teach you. 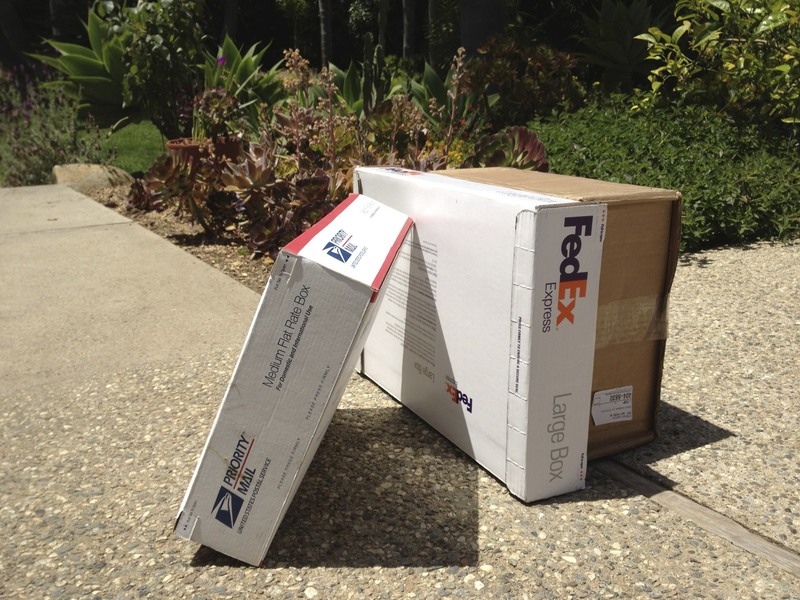 It’s easy and a great little project to do with your kids! Yeah, I know, not very exciting. Let’s not forget the mandate for the learning resolution. 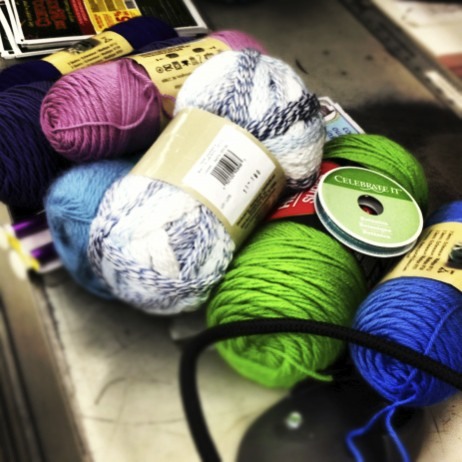 “I’m looking for quirky, seemingly difficult things that most people marvel at, yet could be accomplished if you just make an effort and have the discipline and tenacity to stick with it.” Well, maybe you don’t marvel at it, but I do, especially when I see these yarn bombsgoing off all over the place lately. 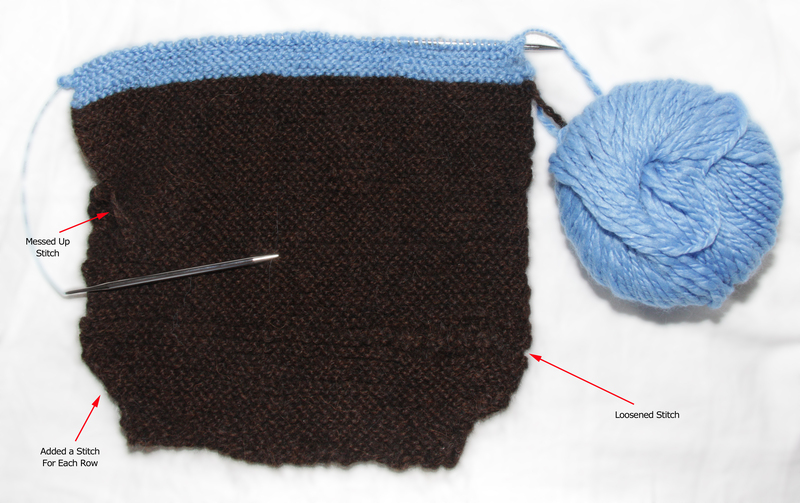 I’m not jumping right into the yarn bombing (although I am secretly fantasizing about it), but instead I am attempting a simple, straightforward scarf with a single ball of yarn. I started last night with instruction from Barb. I figured it would be a way for me to relax, to find my inner zen. What I found, was frustration and anger. I restarted twice and never settled into a rhythm. I went to sleep exhausted and uptight. I will not give up though. I’m hoping that with enough repetition I’ll find that rhythm and learn to enjoy it. If not, at least I’ll have a scarf to show for my effort. 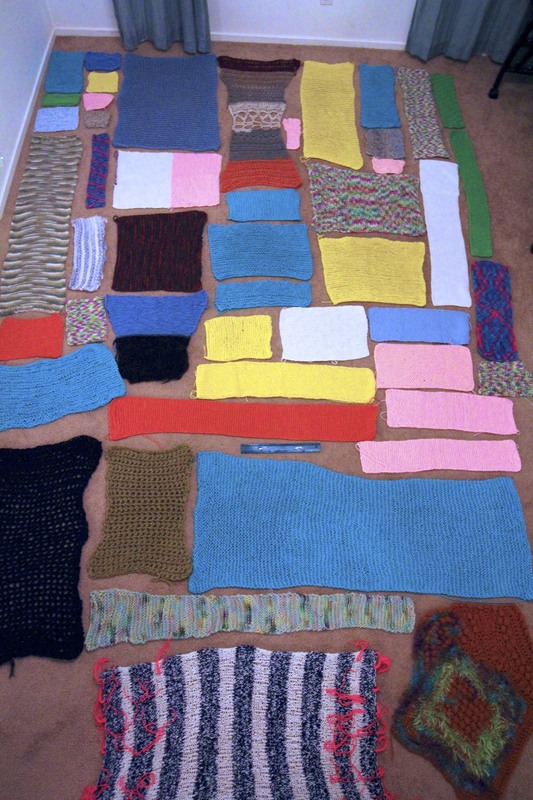 PS: When I mentioned that I’d taken up knitting for my 4th resolution, a friend started sending me a bunch of links under the header, “Inspiration.” Apparently, knitting has become quite an underground phenomenon among some men.